Panel on "Religion im Differenzierungsprozess: Multiple Säkularitäten"
The theory of functional differentiation, in its classical form, has repeatedly attracted criticism and ignited debates that have shaped the general development of sociological theory over the last decades. Against this background, attempts to theorize societal differentiation from other perspectives have recently increased, e.g. following Max Weber’s theory of social action or drawing on Bourdieu’s theory of fields. In addition, traditional points of criticism are joined by a growing general scepticism regarding the idea that “functional differentiation” can be conceived as a fundamental structural principle of occidental provenance which diffuses globally. Thus, regions of global society can be questioned concerning to what extent this principle of functional differentiation has (“already”) become prevalent in each of them, respectively. A similar ongoing critique in the more general context of modernization theory places these assumptions of homogeneity and worldwide diffusion in doubt and emphasizes rather the global plurality and diversity of societal structures. For differentiation theory, this raises a question that has so far not been brought up enough systematically: the question regarding different paths, or patterns, or even cultures of differentiation, which will be the object of a comparative perspective in this workshop. But how would a theory of societal differentiation have to be constructed to allow the systematic comparison of diverse differentiation cultures without bestowing an epistemological and theoretical privilege to a singular (e.g., occidental) form? And how can the law be conceptualized and located in this context – as a relatively autonomous field; as the drawer of boundaries between different spheres and “barriers to dedifferentiation”; or, not the least, with regard to its multiple intertwinements with politics and religion? 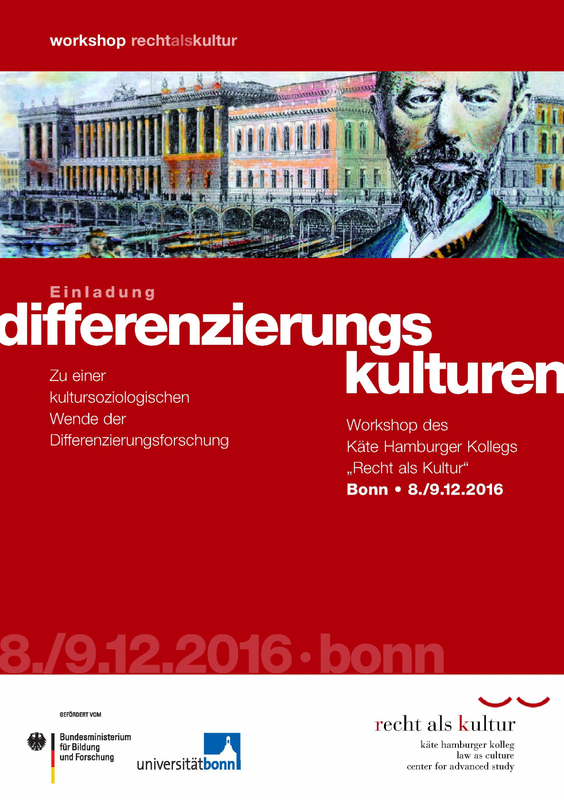 The workshop at the Käte Hamburger Center for Advanced Study “Law as Culture” is dedicated to these and subsequent questions, aiming at a cultural transformation in differentiation research. The workshop will take place in the Max Weber lecture hall.